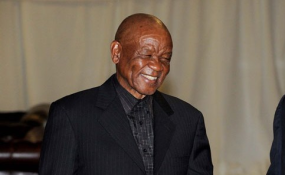 Lesotho Prime Minister Tom Thabane (file photo). PRIME Minister Thomas Thabane was inaugurated on 16 June 2017, with 22 ministers and four deputy ministers sworn-in a week later. Ministers for the portfolios of Home Affairs, Police and Public Safety as well as Tourism, Environment and Culture are yet to be appointed, meaning the already sizeable cabinet is set to increase. In this wide-ranging interview, Tsikoane Peshoane of the Transformation Resource Centre (TRC) speaks to Lesotho Times (LT) reporter Pascalinah Kabi about the size of the cabinet and other related issues. LT: What are your impressions about the cabinet? Peshoane: Much like the two previous elections, we had a hung parliament which forced political parties to come together and form a coalition government. Since 2012, or probably earlier, it became the norm to have a big cabinet. The justification was that the cabinet had to be inclusive to accommodate the divergent political interests of parties in a coalition government. The rationale behind the inclusivity was to foster the stability of the government. But despite the 2012 government having a big cabinet, we did not see that stability and the government could not finish its five-year term. The government that was formed in 2015 also had a large cabinet, with the same rationale, but it also did not finish its five-year term. So it has become clear that having a huge cabinet is no guarantee for the stability of the government. We can speculate that the reason for having a bigger executive is simply to give people positions, especially the loyalists of the political parties in government. It is primarily meant to reward their loyalists. The other question is, why do we all have to be in government? It is because our country has been stricken by a high unemployment rate. It tells you that the government has become the biggest employer and besides that, it also tells you that politics has become a big industry in this country. Successive governments have been turning a blind eye to the reality of unemployment that is confronting them. The cabinet is too big for the population it serves and when you look at countries with bigger populations they still have smaller cabinets than we do. Lesotho has a population of two million population, less than that of Soweto. The second impression I get is that there is no innovation in terms of coming up with strategies to address the current problems. When you look at the 2012 cabinet structure, it is not different from the 2015 and 2017 versions. Let me give you an example; we have had the ministries of Finance and Development Planning with the same mandates since 1998. Yet, we have not been able to come up with creative solutions to such challenges as high unemployment. If you were to look at international economic and political trends, you will realise that the role of the Ministry of Foreign Affairs is shifting in many countries. In the pre-colonial era and just after independence, the ministry was just dealing with the political relationships of states. Trade and economic development were not prioritised among the functions of the Ministry of Foreign Affairs because at the time the problems of the world revolved around wars. South Africa is an example of that shift. Its foreign affairs ministry is called International Relations and Cooperation. Countries are shifting to trade and economic relations because of the realisation of the importance of partnerships for economic development. We should only have embassies foster economic cooperation, hence many of our embassies have been rendered irrelevant now. Unfortunately, our governments have not been responding to, or recognising these trends. The fact that the ministries of Foreign Affairs and Trade have not been merged simply shows that our political leadership is not responding to these trends. We used to have the ministries of Finance and Development Planning as one ministry. They were divided in 2012, but when you look at their functions, they are closely intertwined. Why do we need two ministries because you cannot plan without finance and you cannot finance without planning? We also do not see Development Planning doing the planning. It should also be monitoring. We also do not see ministries coming up with plans that are informed by the master plan designed by the Ministry of Development Planning. LT: Now that you have outlined all these challenges, what would you advise cabinet to do now to ensure they respond to the challenges facing Basotho today; be it political and socio-economic? Peshoane: The government needs to prioritise economic recovery. They need to mobilise the private sector to participate in the economic recovery, and not just say the private sector should come to the party. They need to boost the private sector, particularly local enterprises because they will make their investments here at home. You remember that the government gave money to some companies which were on the verge of shutting down due to bankruptcy. Unfortunately, those companies are not investing in this country. But if you give that money to a local company, they will invest in this country and immensely contribute to the economic recovery. The government needs to identify Basotho businesspeople with the abilities to venture in the textile industries for example. We now have some Basotho who are competing with the Chinese in the production of textile products that are exported to the United States. The unfortunate part is that the companies owned by Basotho don't have the government's support, yet foreign companies get assistance from other entities. As a result, Basotho enterprises cannot compete. Examples of such entrepreneurs is Teboho Kobeli of the Afri-expo Textiles and Sam Matekane who is in the aviation and tourism sectors. Ntate Matekane's company, Maluti Sky, employed about 30 Basotho, and it collapsed because it was competing with the South African Airways (SAA). Remember, Matekane Group of Companies said they had to close company because they have realised that there was no market. That is not true, because South African airlines are still landing at Moshoeshoe I International Airport and ferrying passengers. The problem is that the South African companies have the benefit of state support, meaning that Mr Matekane found himself competing in an unequal contest. The government also needs to pay attention to the performance of its ministries. It needs to establish a monitoring and evaluation department that supervises all ministries and departments while ensuring that everybody is complying. They also need to revise and review the National Strategic Development Plan, since the government is comprised of different political parties, probably with different policy viewpoints. It means that you need to have a document that will consolidate and harmonise these divergent perspectives of political parties. The third intervention is that we need to have radical and robust decisions with regard to luxuries and privileges government officials enjoy. We need to cuts these luxuries. Why should a minister have three vehicles? If we are serious about economic recovery, we need to take a leaf from Tanzanian President John Magufuli. Benefits given to the prime minister, deputy prime minister, ministers and their deputies should be drastically reduced, and the money needs to be reallocated to development programmes. They also need to reduce a lot of international trips which are very expensive. The other issue we need to look at is the national budget. The government should stop pumping a lot of money into non-productive sectors such as the army. Why should the army be among the top five ministries in terms of budgetary allocations? Instead the money should be allocated to such sectors as trade and industry, small and medium-sized enterprises as well as youths and education. LT: Lesotho risks losing free trade opportunities under the African Growth and Opportunity Act (AGOA) and Millennium Challenge Account (MCA) due to the previous government's governance infractions. Do you think the new government will be able to address the Americans' concerns? Peshoane: Fortunately the Americans have made their position clear. They want the government to take tangible steps towards reforms and I think the new administration can do that. I am confident that the government can implement such reforms. We know the character of the premier, and if he does not swiftly respond to those calls, the problem would be emanating from his partners in government. Politicians that want to become delinquent are heavily punished. So if the government does not act towards the implementation of the Southern African Development Community (SADC) recommendations, it will suffer the consequences just like the past government. MCA is very clear in its demands - suspend and prosecute the murderers of Lieutenant-General Maaparankoe Mahao - but if government feels it does not have the capacity to do that, I am telling you it is doomed. I think what has been said by the Deputy Home Affairs Minister Machesetsa Mofomobe is very clear that government should take very bold decisions - those soldiers suspected to be murderers should be suspended and taken to court. The government does not need a year to make arrangements for the return of exiled Basotho and those are the issues the Americans and SADC want to see happening. LT: Are there any implications of having a bigger cabinet in terms of parliamentary performance, especially in a situation where ministers hardly attend parliamentary sessions? Peshoane: It creates serious instability. We have seen here in Lesotho that that Westminster model of selecting ministers among members of parliament does not work because becoming a minister is just a source of income. Everyone wants to get in such positions hence legislators cross the floor leaving governments with insufficient number of parliamentarians to continue to lead. It also sends a signal that we need to review our constitution and parliamentary democracy in terms of floor-crossing. If we do not address those things, the problem will continue to persist. We need to come up with laws that say if a premier has been selected, they must be able to select cabinet members from anywhere so that when people are elected to represent people in parliament, they do not find themselves tempted to cross the floor for cabinet posts. LT: Do you see the opposition having the capacity to destabilise the government? Peshoane: It has but that capacity depends on the attitude of the government towards opposition. Remember the 2007 occurrences when the ABC was in the opposition, it had only 17 MPs, but was still robust simply because the government was aggressive towards the opposition. The ABC survived and got sympathy from the electorate. If the opposition we have now stops antagonising civil society organisations and the media as well as establishing new alliances in monitoring the government, it will definitely give this government a good run for its money. But I am doubtful of that because the opposition are doing themselves a disservice with their current approach. If you look at history, it is not the opposition that usually destabilises the government but governments in Lesotho more often fall because of their own ghosts.